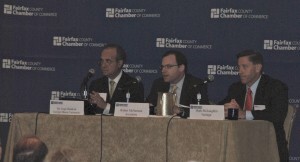 Earlier this week Leo Abruzzese of the Economic Intelligence Unit at The Economist spoke at the “Global Outlook 2012” event hosted by the Fairfax Chambers of Commerce. Abruzzese gave his predictions for the United States economy as well as emerging markets. Guest Panelists included Robert McNamara, Senior Executive in the Public Sector Strategy Practice at Accenture and Mark McLaughlin, President and CEO of VeriSign Inc.
Mark McLaughlin (pictured right) gave technology driven advice to the attendees, showing that the rise of mobility worldwide as well as social media is changing the way all companies will do business. “In developing countries, mobile technology is their computers, they do not have the infrastructure for computers, they only have mobile,” explained McLaughlin. McLaughlin also noted that “the rise of the middle class is driving this shift in technology,” the majority of the global middle class no longer resides in the United States said McLaughlin. “We are also seeing international shifts in the cybersecurity industry, “cybersecurity is moving from the back office to the front office and shifting its level of importance,” according to McLaughlin. 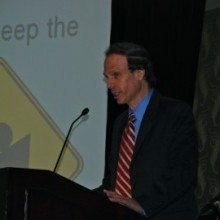 Keynote Speaker Leo Abruzzese, The Economist Editorial Director of North America for the Economic Intelligence Unit, spoke about the United States economic recovery and his predictions regarding the role of emerging markets, including China. In regards to U.S. Congress inability to compromise on what to do about the debt ceiling, Abruzzese assured the audience that there is no chance the U.S. will default on its debt. “They are playing with fire…The U.S. will not default. It will stop paying Social Security or soldiers before it defaults on its debts,” said Abruzzese. Abruzzese cited potential reasons for the recent jump in the U.S. unemployment rates in March and April due to the Tsunami and nuclear meltdown in Japan, the world’s largest car producer, and the increase in oil prices effected by the “Arab Spring.” The second half of this year will be spent getting back to where the United States economy was in January, Abruzzese said. He ended his speech with addressing the emerging Chinese market, “China cannot be discussed too much,” said Abruzzese. In 2017 China will become the world’s largest economy but, “China is collectively rich and still individually poor, its per capital income is $4,000 to $5,000,” noted Abruzzese. “China will remain a poor country for a long time, commercial countries need to think about that,” stated Abruzzese. The real potential for foreign investors interested in China really lies in urbanization. Over the next couple years China will produce “the greatest wave of mass urbanization in history,” said Abruzzese. China will need unprecedented amounts of raw materials, infrastructure, and technology to upgrade its hundreds of cities. 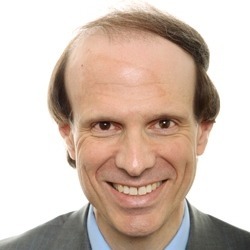 “The geographic shift [to developing markets]has been accelerated with the recession…every [company]needs to have a 10-year emerging market plan,” stressed Abruzzese. In 2009 The Economist Magazine circulated over 1.6 million copies per issue and remains to be a top source for public affairs across the globe. 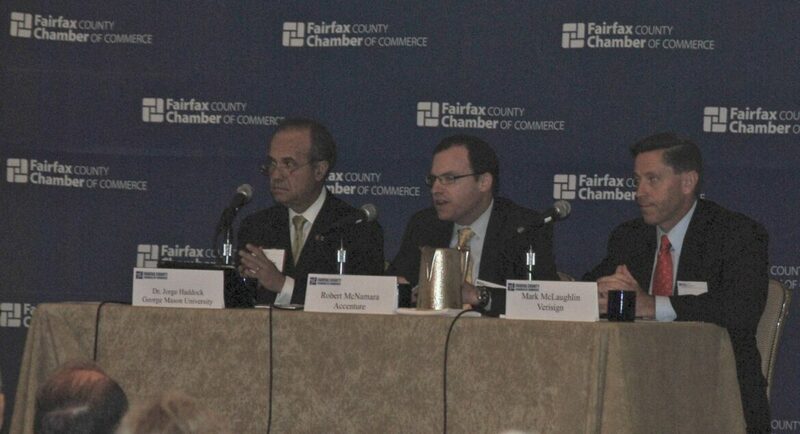 For information regarding the Fairfax Chambers of Commerce as well as future events, look here.